A special award was established in 1998 to honor the memory of Rell Kapolioka’ehukai Sunn, the “First Lady of Surfing.” Rell was diagnosed with breast cancer when she was just 32 and given only months to live. Rather than submitting to the disease and giving up on life, Rell did exactly the opposite, choosing to live life to its fullest. She passed away on January 2nd, 1998 at the age of 47. Rell came to the very first Cancer Center Luau and brought with her the aloha spirit. Established in 1998 to honor the memory of Rell Sunn, the “Queen of Makaha,” this perpetual trophy is awarded each year to the person who displays the qualities shared by Rell and the Moores UC San Diego Cancer Center Luau & Legend of Surfing Invitational – who has made a difference in the battle against cancer and embodies the aloha spirit. 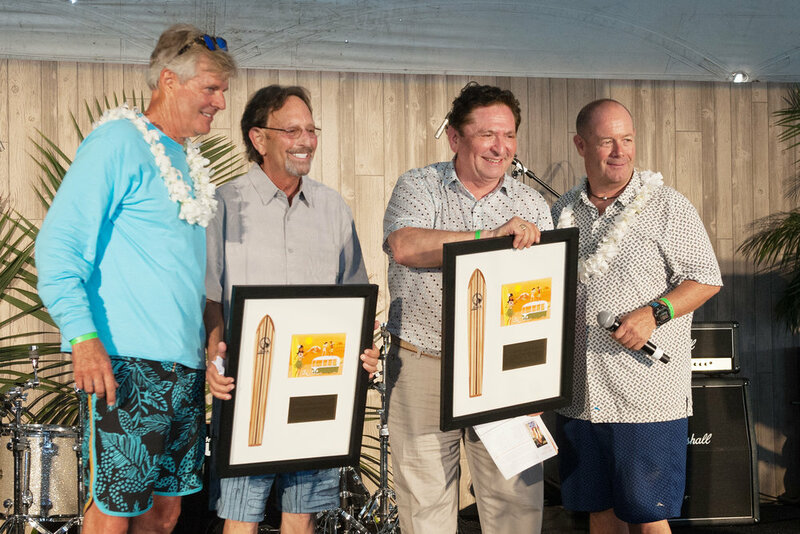 The Rell Sunn Award is presented at the Luau, August 19, 2018. View past award recipients below and contact us to submit a nomination for next year's award. This year’s Rell Sunn Awardees are Howard Birndorf and Ivor Royston, MD, founders of the biotech industry in San Diego, California. Dr. Royston and Birndorf founded San Diego's first biotech company in 1978, Hybritech, with the launch of the Prostate- Specific Antigen (PSA) Test. In the process, they became the catalyst for one of the worl'ds largest biotech communities in the United States. The company was subsequently bought by Eli Lilly and Company in 1986, and Birndorf went on to found a number of other successful companies including Gen-Probe and Ligand Pharmaceuticals. Dr. Royston is an oncologist, researcher, scientist, entrepreneur and venture capitalist, recognized for his efforts to develop treatments for multiple disease targets and to fund biotechnology companies with promising science, technology or medicines. 2000 - Charles “Chuck” Gorder, Sr.